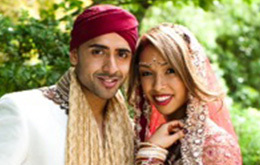 Natalie and Jay - Sonal J. Shah Event Consultants, LLC. The weekend of my wedding was truly the most beautiful and happy weekend of my life. I enjoyed every part of it from start to finish; whether I was laughing, crying, dancing, or eating. Every part of it was perfect. Sonal and her team had everything under control. And I was able to enjoy every second of our wedding weekend. I can’t thank Sonal and her team enough for all their attentiveness and care to all that I had asked and more. I know for a fact that it would not have been so smooth without them. I truly feel that our wedding went off flawlessly and all of our guests truly agreed as well. I can’t tell you how many calls I got saying how well put together the wedding was. Guests appreciate that. It’s not just your wedding but a night off for your guests. They get all dressed up and they spend money to come share the time with you so it’s nice if they enjoy themselves fully too! I highly recommend Sonal Shah for whatever it is you need, whether it’s a wedding or a party. She does a beautiful job and is more than worth her cost! In essence, the services she provides are truly priceless.